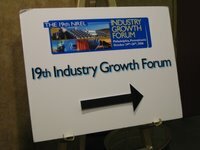 Eleven (11) early stage solar companies pitched their business plans at the 19th NREL Industry Growth Forum running the technology gamut from printable polymer inks and Concentrating PhotoVoltaic (CPV) to Combined CPV and Heat, Concentrating Solar Power (CSP), Invertors, and Thin Films. Plextronics, Inc. is developing semi-conductive and conductive polymers and inks for polymer solar cells and solid state polymer-based white lighting applications. Plextronics envisions printing Plexcore(TM) PV, a p-type semiconductor, onto large area substrates enabling solar cells costing $1 per Watt. The polymer solar cell inks are still in the research and development phase backed by government funding. OLEDs (Organic Light Emitting Diodes) and RFID tags are closer to commercialization; the challenge remains making the polymers and inks more durable. 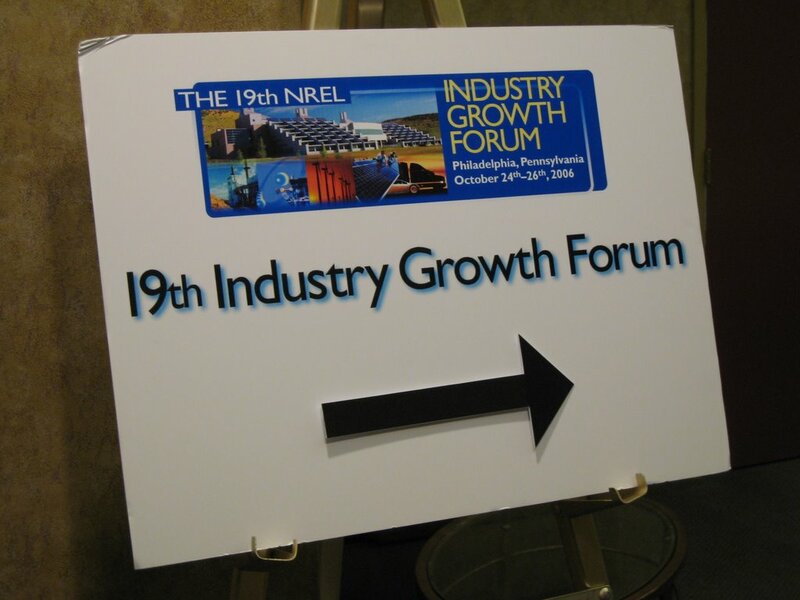 I congratulate Plextronics for winning the 2006 Clean Energy Entrepreneur of the Year Award, but I admonish them for not having a representative present to accept the prize at the Awards Luncheon. GreenVolts, Inc. Founder and CEO Bob Cart plans to deliver the lowest cost utility scale photovoltaic electricity. 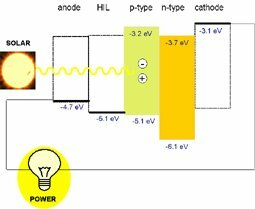 GreenVolts has developed a High Concentration PhotoVoltaic (HCPV) system using an Off-Axis Microdish aluminum reflector mirror to concentrate sunlight onto a receiver with a III-V multijunction (MJC) terrestrial solar cell delivering up to 26Wp (Watt peak). The mirror optical coating technology is under exclusive license from Lawrence Livermore National Laboratory. Thirty (30) quad Microdish modules will be arrayed on the CarouSOL, a two-axis sun tracker, for high power density installations. 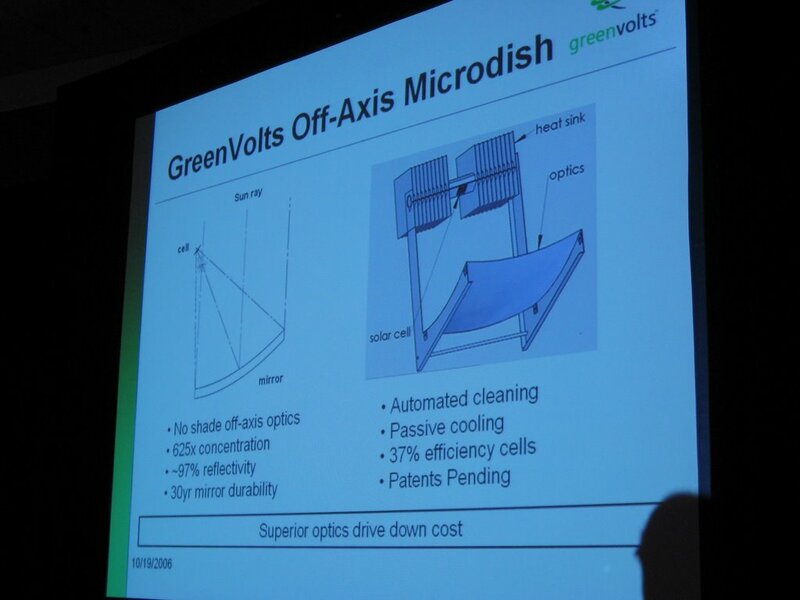 GreenVolts is seeking $4 to $5 Million in Series A funding and plans product development in 2007 and 2008 pilot production. Enfocus Engineering Corporation CEO Dr. Jason Lu is developing a High Concentration PV system, Diamond Power(TM), with a stationary module form factor to address traditional PV rooftop installations. Inside the module, 2-axis tracking keeps the equivalent of 100-1000 suns concentrated on an interlinked array of III-V MJC solar cells. Diamond Power modules will deliver 40-100% more power at lower production and installation costs than equivalent area silicon solar modules. Enfocus is seeking $2.5 Million Series A funding to complete product development and begin pilot production. Prism Solar Technologies Inc. has developed transparent holographic optical elements (HOE) to enable planar Low Concentration PV modules. Stacked holograms use angular multiplexing of incident sunlight for passive tracking with fixed solar modules, and the holograms select sunlight spectra to optimize solar electric conversion. President and CEO Rick Lewandowski claims their holographic technology can produce the same solar module power output with 50-85% less solar cells lowering cost per Watt. Prism’s hologram technology enables the effective utilization of bifacial solar cells which convert incident light on both sides of the solar cell into electricity. Prism is working with partner, Hitachi, Ltd. (NYSE:HIT), to design a module using their bifacial photovoltaic solar cells to deliver maximum power output, presumably with incident sunlight on one side of the module. Prism Solar is seeking $6.2 Million in funding for module production and to establish a European manufacturing joint venture for holographic film, glass, or film inlay production. 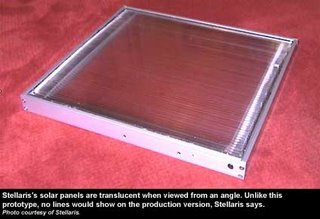 Stellaris Corporation has developed passive Low Concentration PV ClearPower(TM) technology to improve the appearance and performance of solar modules. While VP, Business Development, Lee Johnson would not discuss the technology in detail, he did say ClearPower concentrates at a 3:1 ratio using parabolic lenses and delivers over 20% more power while decreasing module cost by 40% with one third (or 67% less) of the PV material. Unlike high concentration CPV approaches, ClearPower utilizes both direct and diffuse light and can be deployed in insolation challenged locations like Germany or the Northeast US. The Energy Blog at the Fraser Domain had the scoop on the Stellaris technology before the Cone of Silence dropped. ClearPower has a “clear” advantage by appearing transparent outside the 60 degree acceptance angle of the parabolic lenses and can be used for rooftop, skylight, and vertical wall applications. Stellaris is seeking $5.8 Million in Series A funding to finalize development and complete a pilot production line. Wilson Turbopower Industrial Heat Exchangers (from 2005). Ribbon Technology International Single-crystal Ribbon PV (from 2005). Warning – shameless self promotion a la Andy Wibbels. Please subscribe to my feed, http://feeds.feedburner.com/GuntherPortfolio, in your favorite RSS reader, live bookmark it in your browser, or signup for an email subscription to receive future postings.